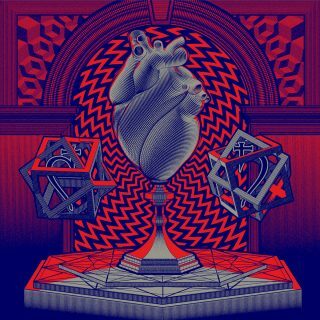 Kaleikr : Heart Of Lead album download | Has it Leaked? KALEIKR was born in Reykjavík, Iceland in early 2016 in order to create progressive and experimental music straight from the heart. Emerging from the ashes of promising black metal group DRAUGSÓL, KALEIKR make the absurdity of human experience palpable through a next-level synthesis of melancholy, intricacy and aggression. ‘Heart Of Lead’ is a phenomenal debut album. Structured as a journey from sadness through despair to total mental collapse, the album begins at a sunrise coloured with the reflective purity of viola, gradually becoming darker and stranger with each following song as it builds towards a never-ending sunset. KALEIKR use the riff-complexity and clarity of progressive Death Metal, sparing bursts of emotive Black Metal dissonance, forlorn Hellenic leads and section transitions worthy of prime OPETH or ENSLAVED - all coated in a translucent layer of preternatural psychedelia - to augment lyrical themes of self-contradiction, despondency and delirium. ‘Heart of Lead’ possesses the depth of feeling present in the finest Icelandic black metal; that particular sense of the saudade, a longing for something missing, absent and just out of reach.